Shyamoli Paribahan a Pvt. Limited is a private bus service of Bangladesh established in the year of 1988. 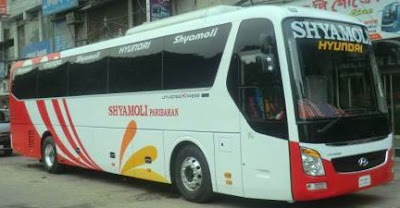 The buses of Shyamoli Paribahan are famous for luxury coaches and good services. Shyamoli Paribahan is Bangladesh's second largest privately-owned passenger transport Company Operating buses in numerous inter-district routes as well as international routes like Dhaka-Kolkata, Dhaka to Shilighuri, Dhaka to Agartala, and Dhaka to Shilong to Guwahati. Shyamoli Paribahan was first established on 1988 by a successful businessman, the chairman of the Shyamoli Paribahan Pvt. Limited Mr. Ramendranath Ghosh. Shyamoli started it journey with only one bus which was operated in Pabna to Ishwardi route. But now it run a fleet of around 300 modern buses all over Bangladesh and also in some area of Bangladesh. Though it started with a normal bus, it increased its quality in order to ensure customer’s comfort and safety. BRTC bus stand, Komlapur, Dhaka. 167/21, Inner Circular Road, Arambag, Dhaka. Shyamoli Paribahan has every hour bus service for various routes (The costumers should contact to counters to know his/her desired destination’s time schedule, because all the buses routes are not available every hour). The buses of Shylhet and South Bengal are departed from Saydabad counter, buses of North Bengal are departed from Kallyanpur counter. There are three options to visit India from Dhaka, Bangladesh. Those are Bus, train or Plane. Among them bus or train journey is most preferable by tourists.Because they can enjoy sightseeing on the way to visit India from Bangladesh. Bus and train journey are both cheap and enjoyable than plane journey. The first bus service to Kalkata started on 9 july, 1999 after 43 years and in 22 September, 2003. The top bus service providers: BRTC, Shyamoli Paribahan, Suharda (owned by Indian government), TRTC (Tripura Road Transport Corporation), Soudia Paribahan, and Shohagh Paribahan. Shyamoli Paribahan is most preferable by touristsamong them. Because the buses are comfortable and safe. For the comfort of the tourists, they use RM2 and VOLVO brand’s buses. They also arranged online ticket servicefor the benefit of the tourists. 1. Buses leave every day at 11 am. Friday is weekly holyday. 3. Passport number is needed for buying ticket, no need to bring passport photocopy. 4. Tickets should be booked before 3 days of the tour. Ticket can be cancelled if needed by giving 10% remuneration. 5. There are facilities for drinking water and morning breakfast in the bus. For entertainment there are DVD and sound box in the bus. All bus has AC. 6. Smoking is forbidden in the bus. There are arrangements of polythene for those who vomit in the bus. 7. Bus can go into India only through Benapole port. Passengers will have to come in counter own. 8. Benapole in Bangladesh and India are Haridaspur are customs check-up point. Usually it takes 30 minutes for check-up. The customer’s don’t have to change buses. 9. Separately, a passenger can take a maximum of 10 kg accessories. 10. For overweight customer will have to pay 30tk for per kg as additional money. 10. For the safety of bus passengers, two armed members of Ansar stay in the bus. 11. There is no separate service. There is no provision of first aid for patients in the bus. 12. There are no special instructions for passengers. All information is provided inside the bus. 13. They don’t help customers in currency exchange. Shyamoli Paribahan becomes one of the most preferred transport operator of Bangladesh.Because of their superior quality and comfortable buses like VOLVO, RM2, HYUNDAI etc. They gained reputation very fast because their ticket prices are affordable and in the same time they try to satisfy their customers with luxurious buses. They actually come across this long way because of their strong modernized business model and strategy and dedication to serve the customers. This made Shyamoli to become the preferred transport operator in Bangladesh.